1. Cross stitch: I started it seventeen years ago and thought my sabbatical would be the perfect time to finish it. 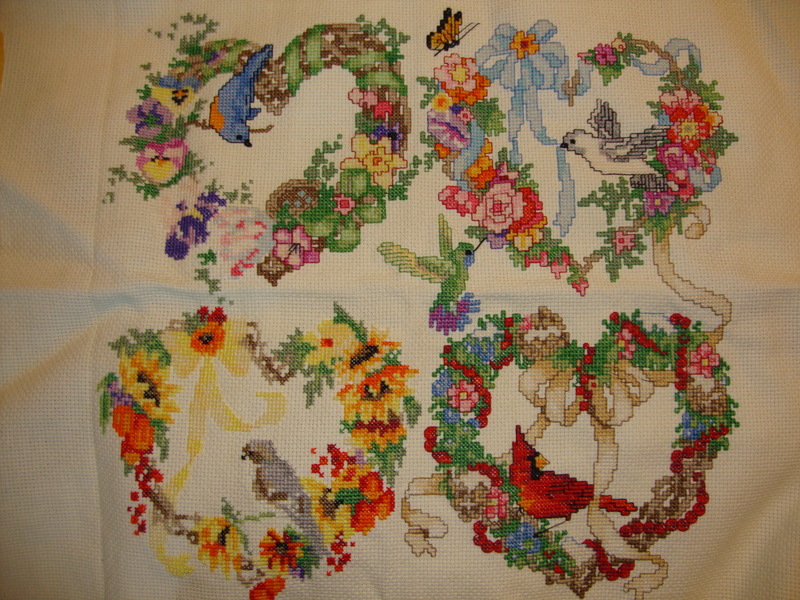 It’s a garden-themed pattern, too: four wreaths of flowers and birds, one for each season. Most of the time my hands were too dirty from pulling weeds. 2. Visit the Toronto Music Garden. This part of the city’s waterfront boasts a reflection in landscape of Bach’s Suite No. 1 in G Major for unaccompanied cello. It was designed by cellist Yo Yo Ma and landscape designer Julie Moir Messervy, who collaborated with landscape architects from the City of Toronto’s Parks and Recreation department. I came close to getting there last week but it was too hot and I was too tired. 3. Read all the books on my list. Granted, there were alot of books on that list. But I also kept receiving referrals from my friends and discovering new titles when I went to the bookstore. 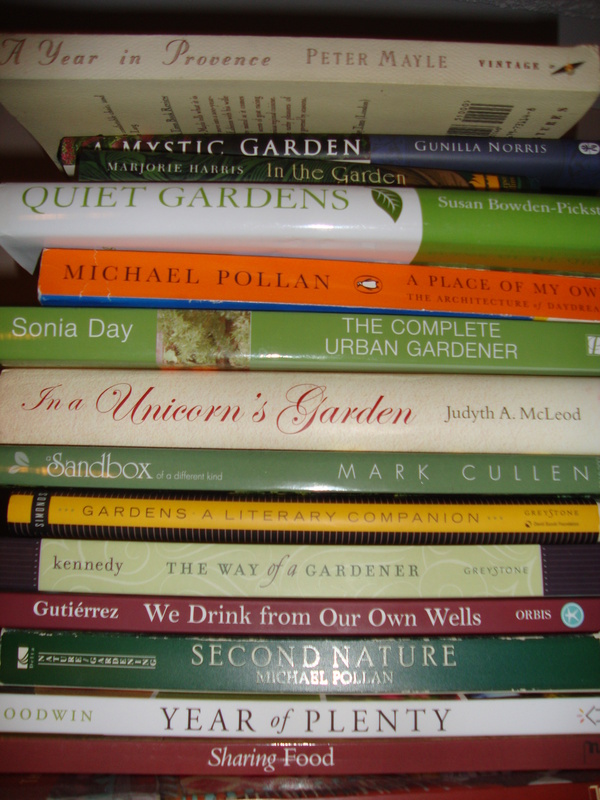 I just couldn’t keep up–there are alot of fantastic garden-related books out there. 4. Sit in the backyard doing nothing. I used to have two wooden muskoka chairs under the tree in my shade garden. Last year, one was so badly rotted I had to throw it out. I used a rock to prop up the other one. This spring I finally had to remove it from the garden, too, lest someone kill themselves trying to sit down. I did some research on replacements but got bogged down in the debate over treated wood, painted wood or recycled plastic. 5. Repair the fountain in my backyard. I thought about it alot, I really did. But it’s a low, rocky kind of fountain that sits flush with the soil, so it didn’t look broken. The plants around it have grown so nicely that I hated to disturb them. 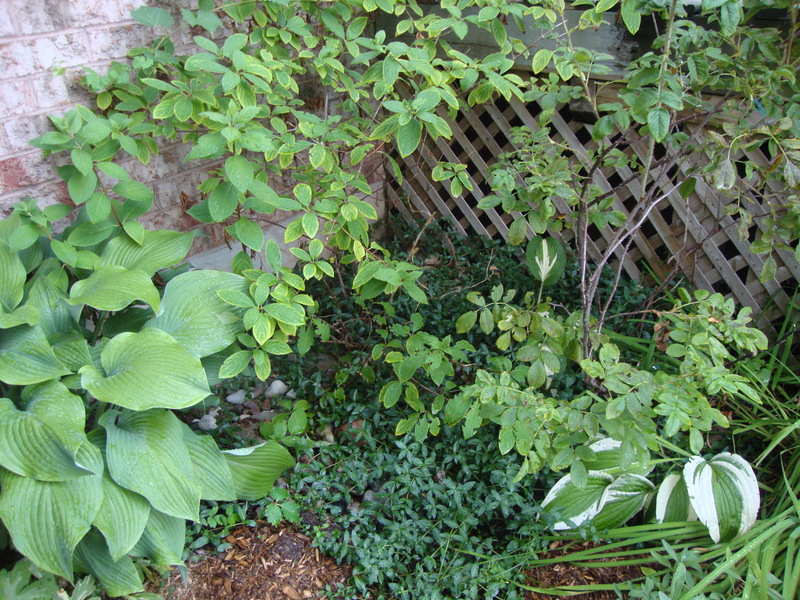 And really, on a warm summer day, who wants to rip apart a pretty garden? No, I didn’t get to everything on my sabbatical wish list. In fact, I spent alot of time thinking about how little I was actually getting accomplished. Time just seemed to float by while I got less and less done. But maybe that’s a good thing. This wasn’t supposed to be a strenuous project, crammed full of daily to-do lists, right? Besides, I like that there are still a few un-read books on my night stand. I still dream of visiting the Music Garden. And maybe one cold snowy night this winter I will finally get to doing that cross stitch. Perhaps those things will be my opportunity to cultivate sabbatical living when I am back to my real life. The book of Genesis says that God rested on the seventh day of creation. So I don’t think I should wait another fifteen years before observing my next sabbath. This entry was posted in Uncategorized and tagged gardening, rest, sabbatical. Bookmark the permalink.